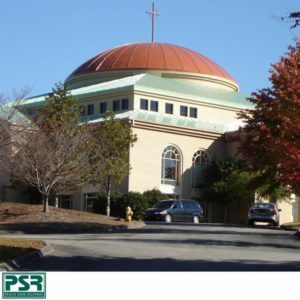 The Challenge – As a structure that has been around for more than 20 years, Mount Carmel Christian School was built as one of the largest religious sanctuaries in the state of Georgia. Still standing on its original workmanship, Mt. Carmel was constructed with a 20 gauge standard steel 6 on 12 sloped deck covered with 24 gauge standing seam metal roof panels. With a 24 gauge turn metal radius dome sitting atop the main roof, the total structure compiles roughly 35,000 sq ft. Since the day Mt. Carmel’s original roof was completed, the facilities staff battled leaks due to the roof being incorrectly installed at the start. Major water damage occurred all throughout the interior building. The key challenges that had to be met were the extreme OSHA safety requirements due to the severe slope of the dome and lower roof along with the complexity of perfectly covering the dome to give the overall roof the appearance of a metal system. Before construction started, a systematic approach was studied and developed to meet all meticulous challenges for this project which would provide excellent workmanship, first class service, and a solution that would achieve total satisfaction for the issues facing Mt Carmel Christian School. The Construction – Before any immediate roofing construction took place, a 2 week period was spent manually installing a detailed safety network. With multiple levels of roof, a solid perimeter railing system was built up around the base edge of the structure for the purpose of fall protection. Once this system was in place, workers built wood scaffold decking around sections of the base of the dome and flat-arched wood step ladders were built to aid in scaling up the severe slope. All workers were 100% tied off to the cross of the dome at all times while assembly was in progress. After the 2 week period of safety setup, construction began. Roof construction started with the dome. Quarter inch Dens Deck was field cut into “pie-shapes” so that the board could be contoured around the radius dome smoothly. Broad ends of the board started at the base of the dome and ran up to a point at the top of the cross. After assembling the unique design on the surface, the Dens Deck was mechanically fastened to the metal deck. Once in place, Sarnafil G410-14 Feltback membrane was field cut into “pie-shapes” and prepared for being fully adhered to the dome. The unique shapes were chosen to create a “no-wrinkle” appearance for the membrane. Extreme caution and supervision were required while adhering to the complex arch of the building. Five workers were required to lay each layer of membrane to ensure a perfect contour from the base to the top. Once the first layer of membrane was secured, the next layer was overlapped, adhered, and heat welded to the existing membrane. Severe attention was paid during the welding due to the fact that a heat walker was run from the top down on an uneven surface which meant balancing the equipment by hand on the seams while it was being lowered by cable. An average of three section a day were placed in order to ensure a perfect decor system. There totaled 32 section days of work for the dome alone. After completion of the membrane around the dome, a repeat process of heat welding was replicated for decor seams a 1/4 inch away from the field seams for the purpose of hiding the seams from ground vision. During construction of the base roof sections, 1.5 inch polyisocyanurate board was cut in 12 inch strips to fill between the panel ribs. Half inch Dens Deck was then applied over the polyiso board and mechanically fastened to give the lower roof sections a flat surface. G410-14 was laid vertically, fully adhered, and heat welded to each existing layer of membrane. The heat walker was manually supported and lowered by cable for the field seams and decor seams. The Result – Through a detailed and sequential strategy, Peach State Roofing meticulously monitored the Mt. Carmel roofing project ensuring that it ran smoothly and was completed to perfection. With the highest degree of service and support, this roofing project was completed with extreme excellence. Many members of the congregation stated that they never knew Peach State Roofing was there during the re-roofing project. Mount Carmel Christian School was nominated for the Sika Sarnafil 2008 project of the year for the absolute fact that master workmanship, creative abilities, and world-class performance achieved in the highest degree.